Information encrypted using quantum physics could soon be transmitted over long-distance networks, thanks to a discovery by Alberta physicists. 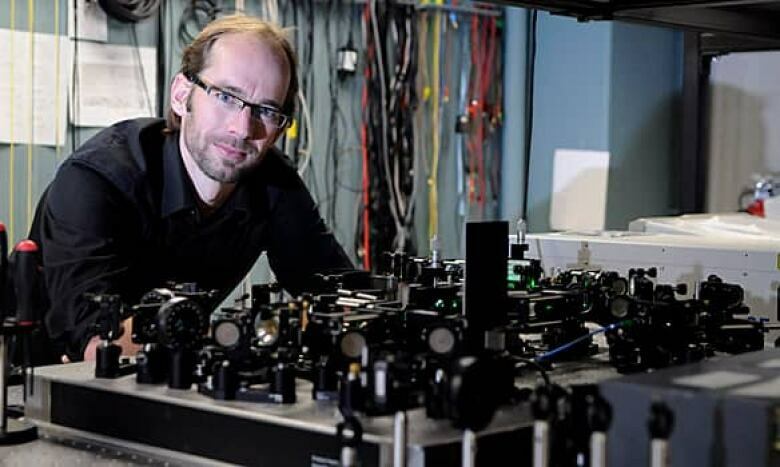 'The technology we use here is very close to what telecommunications use already,' said University of Calgary quantum physicist Wolfgang Tittel. ((Riley Brandt/University of Calgary))Information encrypted using quantum physics could soon be transmitted over long-distance networks, thanks to a discovery by Alberta physicists. For the first time, information coded in light using a quantum physics phenomenon called entanglement was successfully stored and retrieved from a crystal, researchers at the University of Calgary and the University of Paderborn in Germany reported Wednesday in the science journal Nature. Tittel and his colleagues created a memory device consisting of a crystal embedded with particles called rare-earth ions. 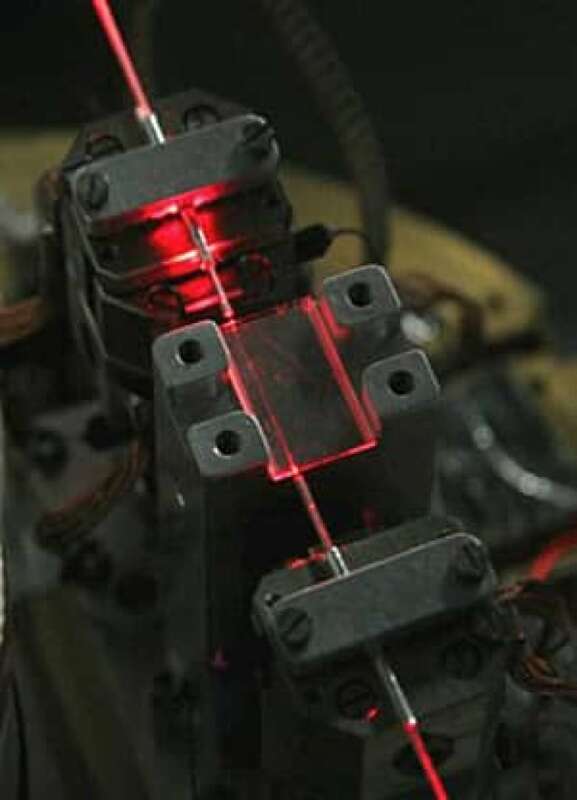 They then used a laser to produce two entangled photons, one of which is absorbed by the crystal. When the crystal is cooled to very low temperatures — around –270 C — the photons can also be pulled back out of the crystal. After being put in and pulled out of the crystal, the researchers tested the degree to which the two photons were still entangled. "What we found is that … entanglement has not been degraded after storage," Tittel said. "The technology we use here is very close to what telecommunications use already," said Wolfgang Tittel, a University of Calgary professor who co-wrote the paper. It was published online alongside a study from researchers at the University of Geneva in Switzerland who reported a similar finding using a different material. Quantum mechanics is the branch of physics dealing with the strange behaviour of very tiny things like elementary particles and atoms, and is extremely different from the physics that humans experience every day. Quantum entanglement, used in quantum encryption, is the linking of two quantum objects so that any change to one is immediately experienced by another, no matter how far apart they are. The advantage of quantum encryption over traditional encryption is that it has the built-in ability to allow people sending and receiving the encrypted messages to detect whether someone has tried to "eavesdrop." Quantum encryption of messages is already available commercially, but current technology only allows communication between two points less than 100 kilometres apart, Tittel said. That's because they're transmitted over a silicon fibre, and roughly 50 per cent of the photons are lost for every 10 kilometres they travel. Theoretically, the distance problem can be overcome by breaking the distance into shorter segments and boosting the signal after each segment. To do that, a device positioned between segments would have to take in the message as a weak signal, repeat it as a strong signal and send it along the next segment without damaging the information. Such a theoretical device is called a quantum repeater. In order to work, it would need to store the information until it has been completely uploaded to the next segment. "Our discovery is such a quantum storage device," said Tittel. Physicists had previously shown it was possible to store entangled photons in atomic gases, but that isn't very practical for everyday use, he said. The advantage of the new storage method is that it uses solid-state crystals like those used in regular computing. The possibility of storage also allows for the possibility of a quantum network, where information could be relayed to any of several different locations via nodes between them. It could also allow two pieces of information to be combined. Suppose you get an email, Tittel says, then store it and wait for a second email. "Once you have both emails, you can do something new — you can compare the information in the two emails and derive something." Tittel estimates that a proof-of-principle quantum repeater will be available in five years, and quantum networks may be possible in 10. But in the meantime, he says, engineers and digital physicists will need to get involved to modify the device and make it more practical.